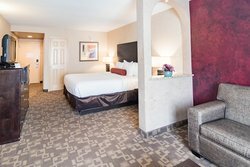 Perfect for travelers looking for upscale and spacious lodgings, our King Suite has everything you need to stretch out and relax after a busy day in Elmhurst. Our spacious one bedroom suite features a pillow top king bed and two-person sleeper sofa for additional guests so your whole group can enjoy a restful night's sleep. Sleep well in our hotel suites with separate living and bedroom areas. Enjoy your favorite show on the 32” flat-screen TV while lounging in the living area. Business travelers can work outside the office with ease at the large desk with an ergonomic chair and our high-speed Wi-Fi. Our spacious executive suites have dedicated work and sleeping spaces so that you can focus on the task at hand during the day. Conveniently prepare for your morning meeting or large conference just steps away from our versatile meeting space! 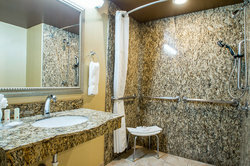 Don’t forget to take advantage of the rest of our hotel’s well-appointed amenities. Wake in the morning and get to your meeting with ease using our shuttle services, keep up with your fitness routine at our on-site fitness center, or enjoy a delectable meal at our Bistro C restaurant.